Those tiny silver marbled leaves are a year round delight, the flowers fleeting. I've always loved the butterfly paired leaves of Bauhinia. We have street trees in Porterville, huge leaves and OTT pink flowers the size of my spread hand. The orchid tree from India and China. Still too large for my garden is Bauhinia galpinii with terracotta flowers deceptively like nasturtiums. Pride of de Kaap, but that isn't the Western Cape, it's south of Nelspruit in Mpumalanga. 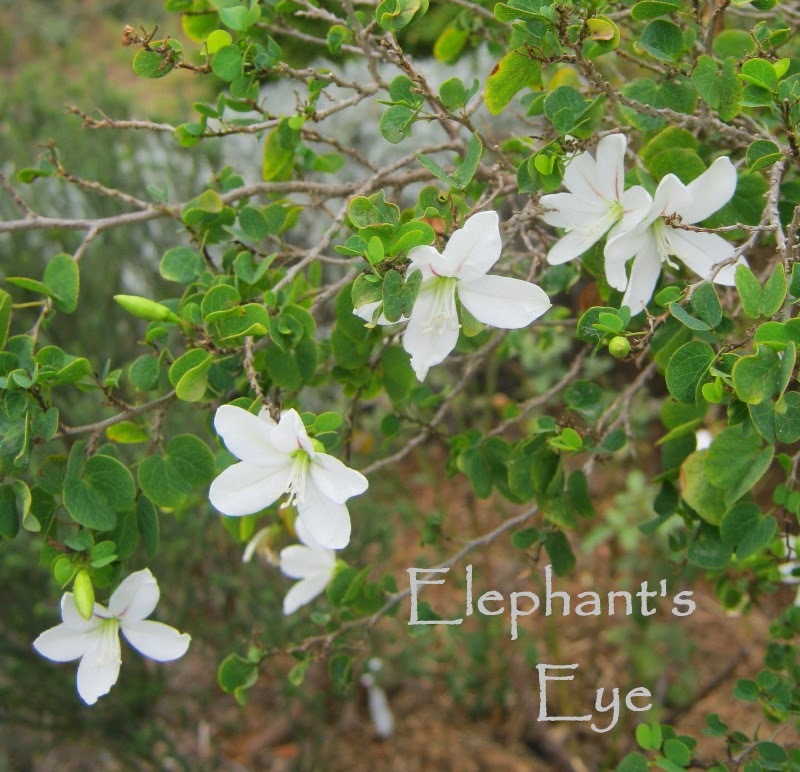 What I can fit in my garden is tiny Bauhinia natalensis with ethereal white flowers dancing like butterflies among miniature leaves. Fabaceae with peas and beans. Zone denial, this plant is from the summer rainfall side of South Africa, but in Paradise and Roses it gets watered weekly in summer. Bauhinia was named by Linnaeus for the identical twin brothers Johan and Caspar Bauhin, both botanists and herbalists from the 16th century. Port St John's creeper Podranea ricasoliana comes from the Transkei, yet again the zone denial heavy rainfall side of South Africa. Since the Ungardener has been watering more, our plant is flowering. 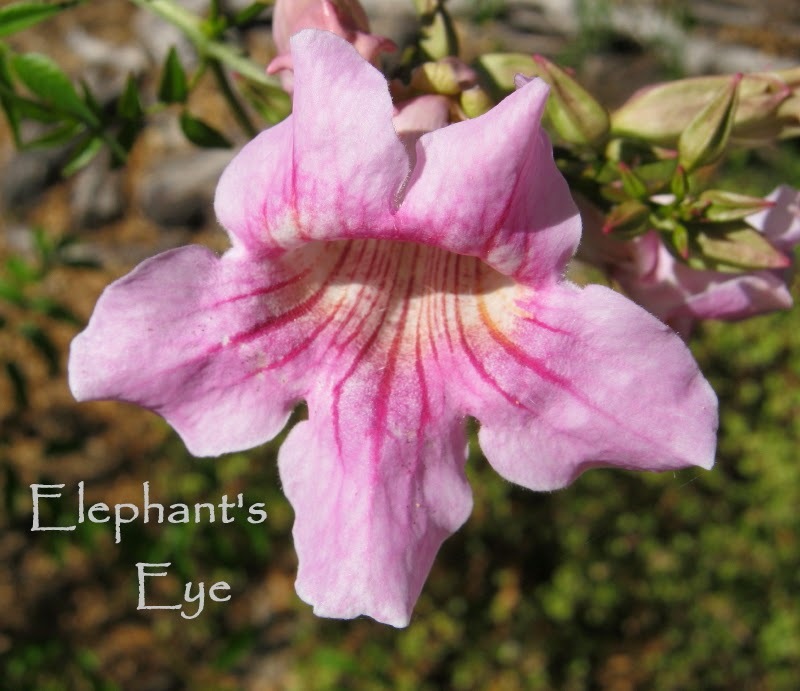 Many South African botanists suspect that this plant is a heritage of slave traders. Bignonaceae family with Jacaranda from Argentina and our Tecoma. The roses appreciate the first rain and we have some flowers. Papa Meilland, Chaim Soutine, Duftwolke and Casanova, with buds coming on the others. Our neatly Swiss stacked firewood has morphed from 'decor object with tactile texture and clouded colours' to 'Last year we had our first fire on the 9th April'. Winter has reached her chilly fingers out. The turning season also bring my posts of indigenous bulbs to life. Almost the 'Jersey' lily Nerine sarniensis has opened her gold-spangled scarlet flowers. Crassula leaves glowing like flames. The Ungardener has been busy 'spring' cleaning the pond and removing excess water weed. 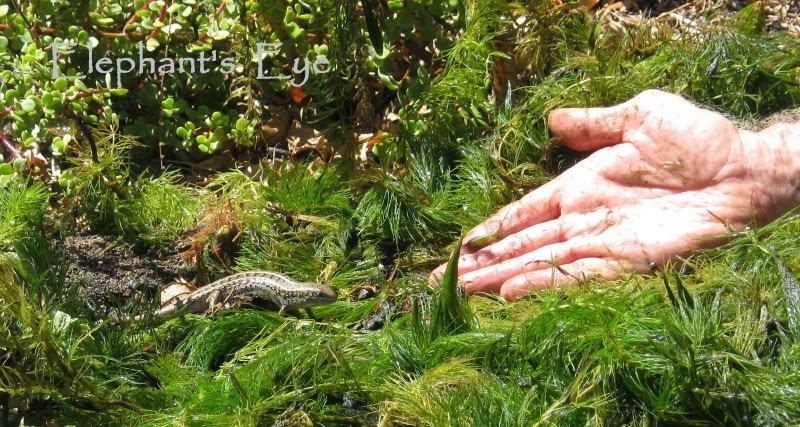 The resident lizard has learned to harvest his lunch, including don't bite the hand that feeds you, dragonfly larvae. Between his work and the rain Ungardening Pond is reflecting like a mirror, as it should! 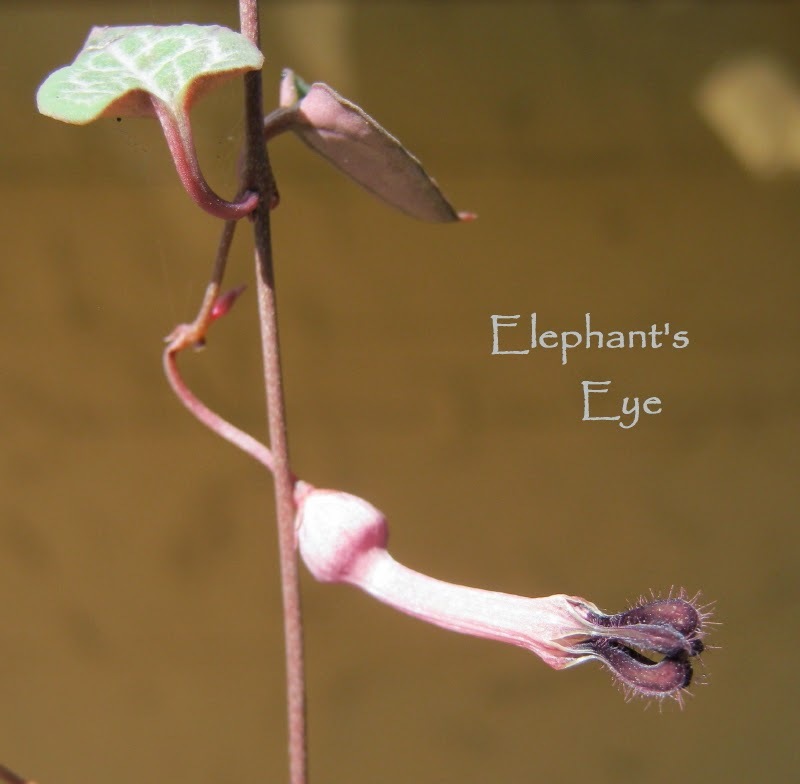 This Wildflower Wednesday with Gail at Clay and Limestone in Tennessee, I turned to 3 treasured beauties that have missed their moment of fame on Elephant's Eye until now. Except the roses (and the Podranea?) all today's plants are South Africans. 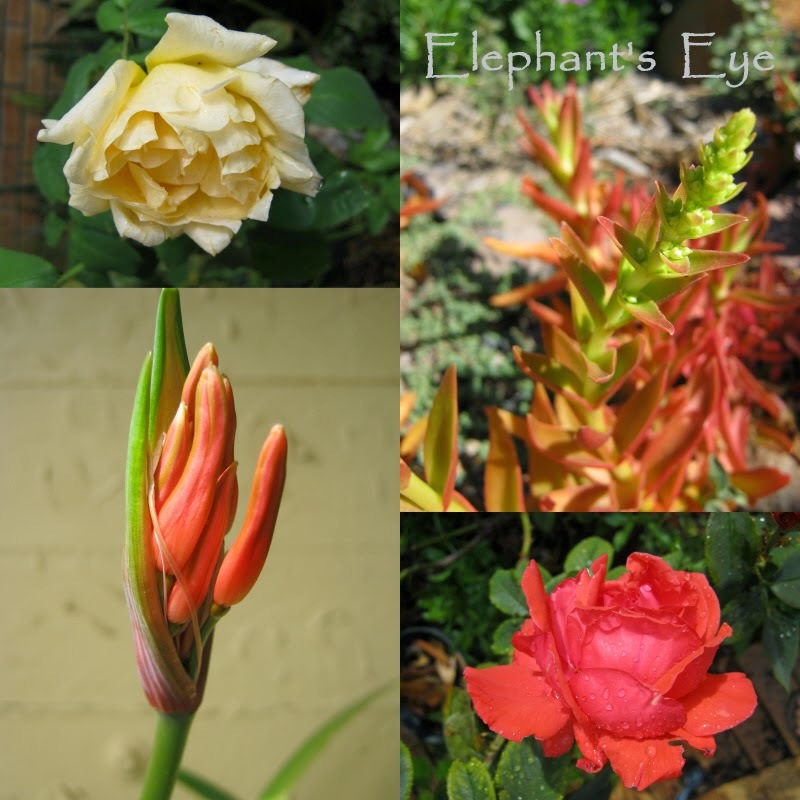 Background information on South African plants is from PlantZAfrica. Great post! I'm particularly enamored of the String of Hearts--everything about it, actually. 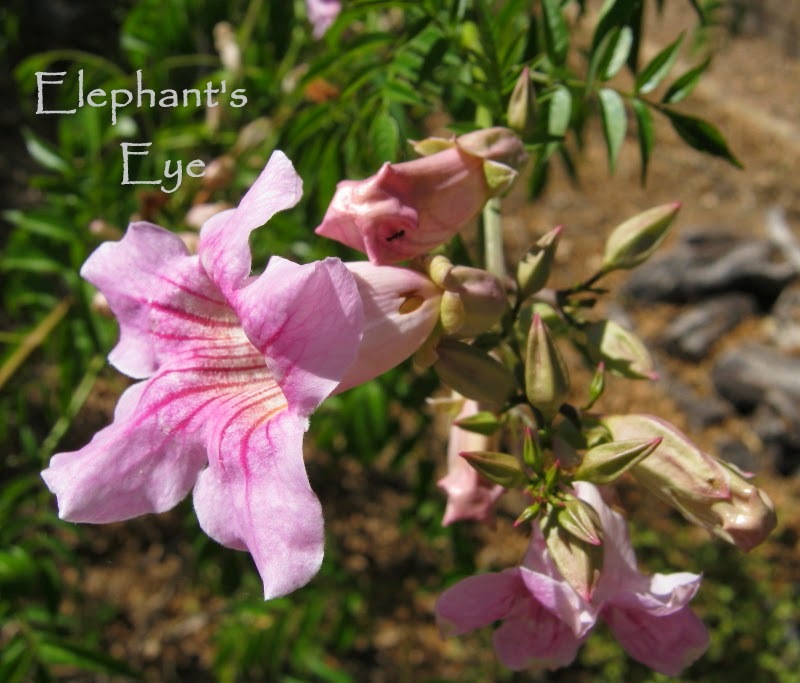 The nickname, the flower, the foliage, the form, the color. Luck you to have it as a native wildflower in your country, if not in your actual area. It's quite fun to see the native plants from around the world, and you have some stunning ones! 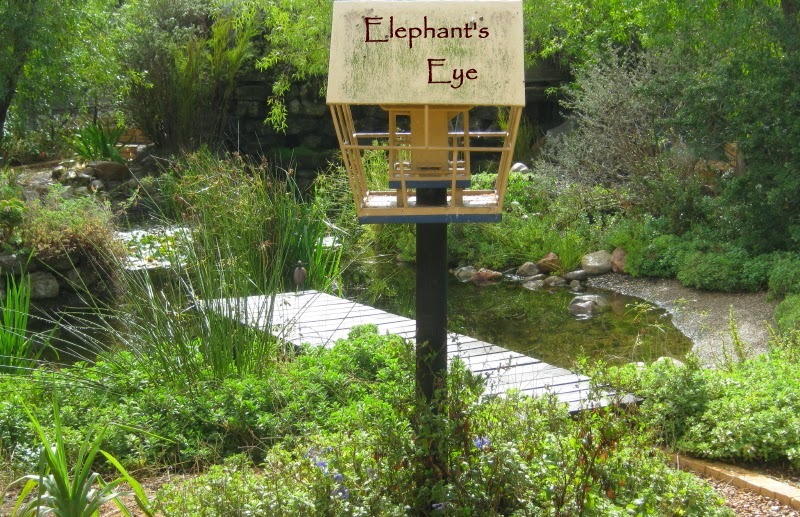 The last view of your pond is lovely! 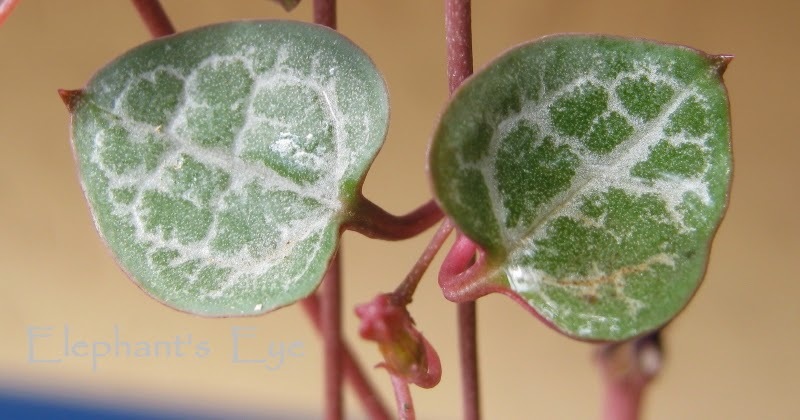 I have String of Hearts as a houseplant. I love it! How nice to find it in your wild gardens. Your pond is gorgeous, natural and full of life. 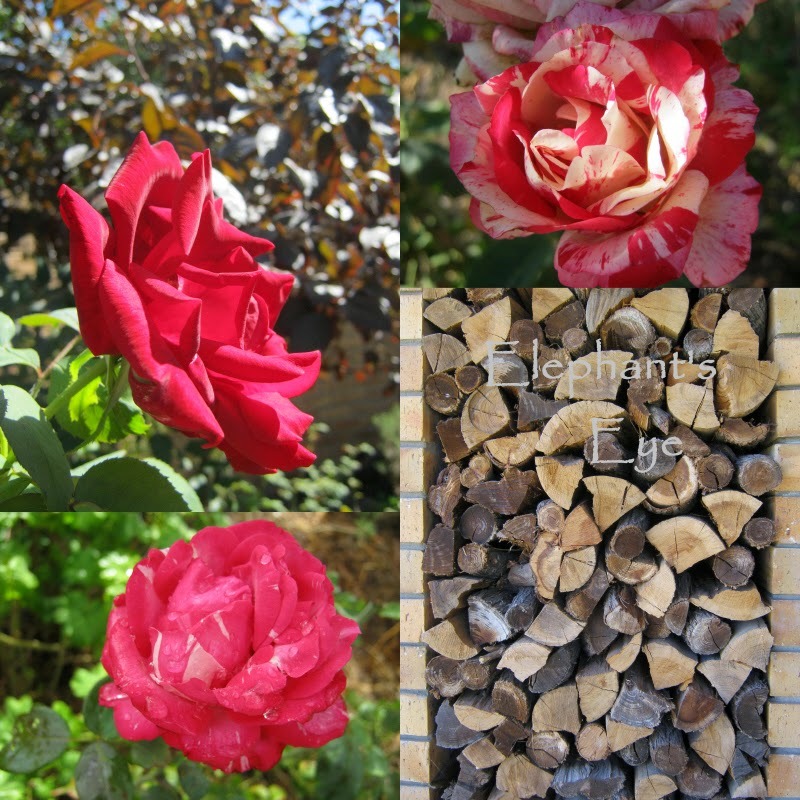 I'm not often a rose fan but I do rather like the one you have in the top right of the square. Chaim soutine, with the stripes, each flower a little different. WOW that last pic is perfection! Loving the color on those roses. I like the rose with the pinkish white markings.....very different. Hope all is well with you. Your pond makes me want to get out there and get my shovel digging in the frozen ground..but it would be filled with fir needles in a short time. Your's is gorgeous. Our next garden will have a pond, but, smaller garden, smaller pond! I do love that pink of the Port St John's creeper with it's prominent nectar guides! Happy WW! Diana, reading about your garden over the last few years has convinced me and my spouse Michael to put your part of the gardening world on the must see list! South African plants show up in almost all the garden blogs ... my bucket list has the High Line in NY and the Lurie Gardens in Chicago. I am glad you had some rain. Your roses are lovely as ever. Bauhinia is my kind of plant; gorgeous foliage with interesting, though fleeting flowers! How amazing gardeners are to bring you a part of their gardens. I love those leaves...the pond is beautiful. Mine is melting and will spring to life soon....spring is very late this year and your winter seems early. 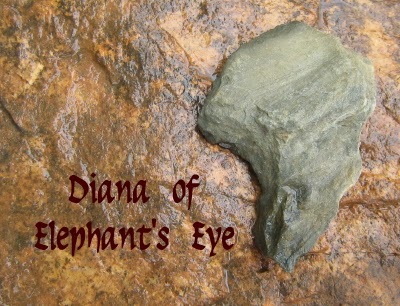 I appreciate your informative post, Diana, from a part of the world we hear too little about. And I like the integrity of your garden the care you put into it. That's incredible that people brought you plants! Did you write an article for a magazine asking for them? We are barely on the cusp of spring here. I love how tame the lizard is. Our skinks scatter as soon as they see us. It was a column in the magazine. -- Diana has Watsonia corms. 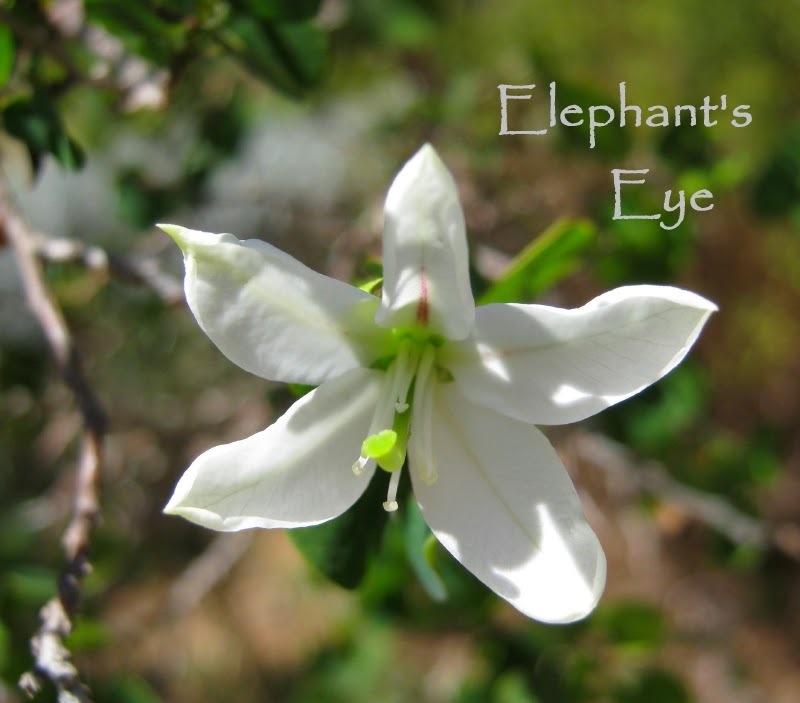 -- Mariposa is looking for March lilies. They still run the china column. -- Diana needs 3 side plates in Noritake Spring roses, sort of thing.